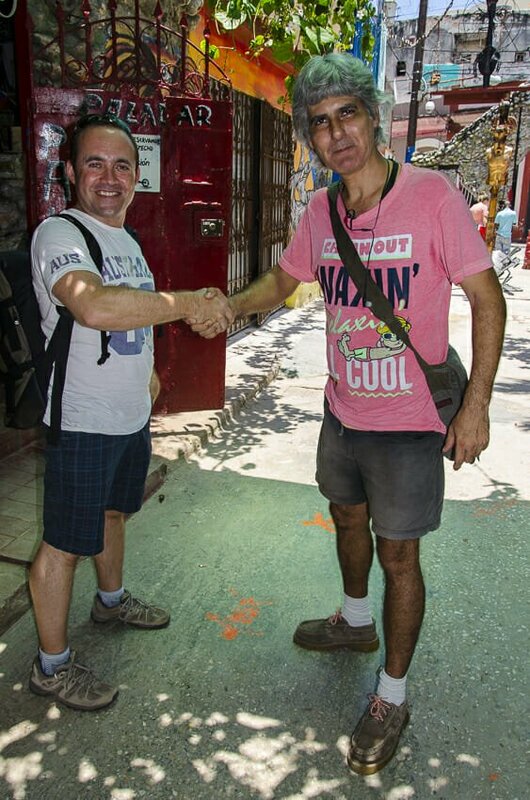 One of the best things about traveling is meeting the locals and getting to know more about their lives and culture. After all, apart from the scenery and sights, isn’t this why most of us travel? 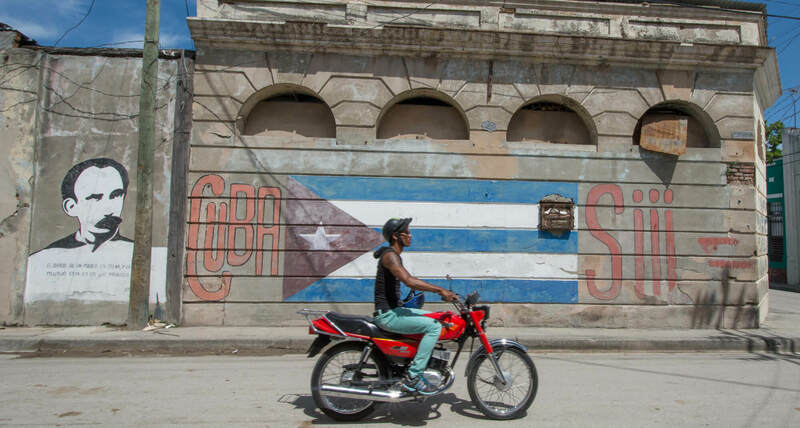 During our trip to Cuba we really felt like we got to meet some great locals, whether it was a bici taxi driver or a casa owner (read more about staying in casas particulares here). 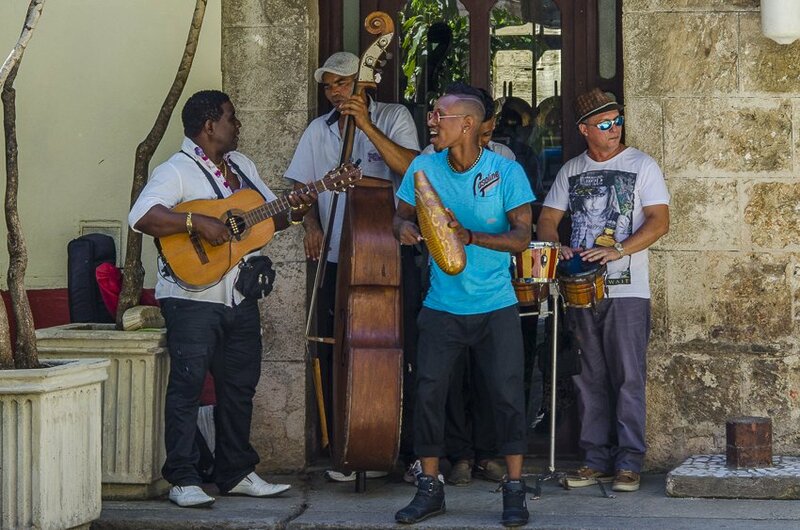 Music is such an important part of Cuban life. 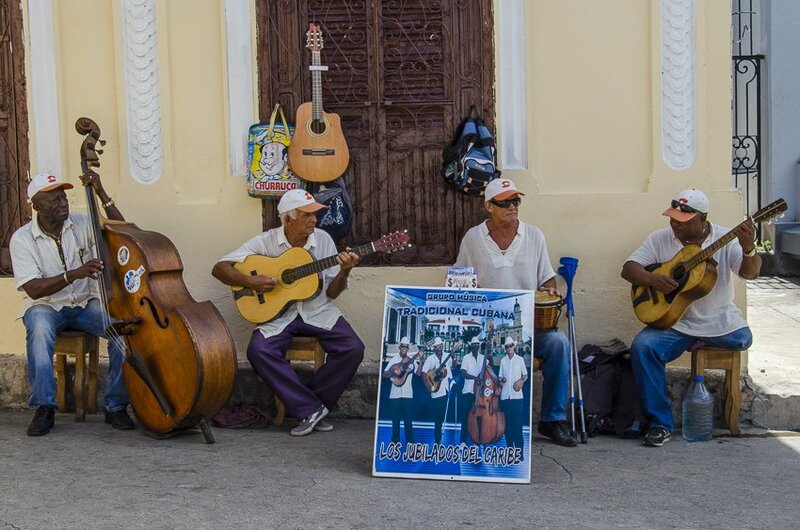 You hear it everywhere you go, whether it is from street performers to locals having a party on their front porch. Dancing goes hand in hand with the music. Rhythm is in their veins. 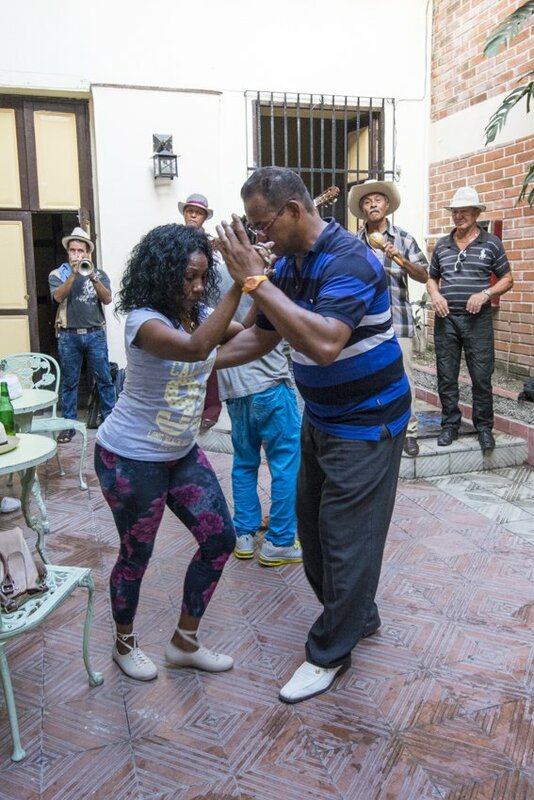 Cubans move so naturally and without inhibitions. I’m sure Lesbiel was feeling frustrated with us during our salsa lessons. 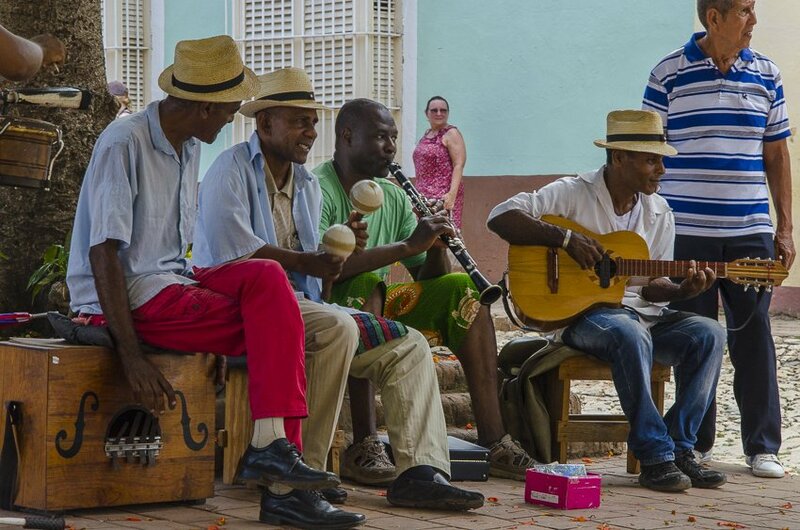 Singing is also part of their musical repertoire, as this lady in Santiago de Cuba demonstrated. 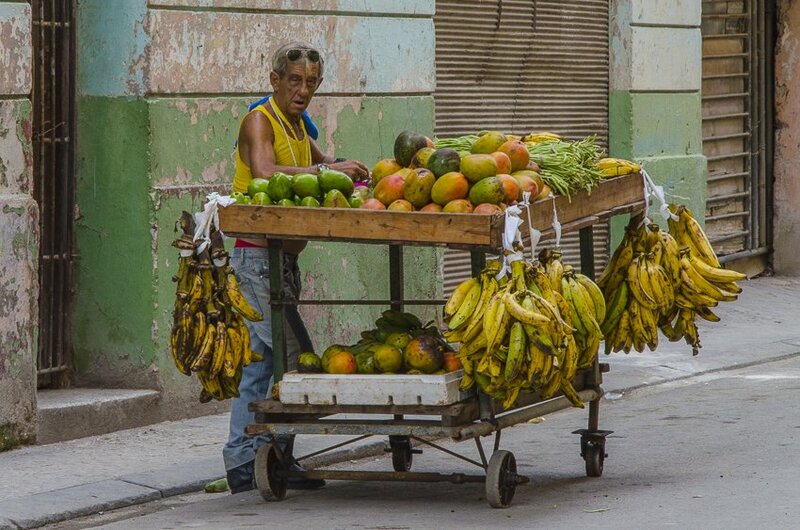 The best place to buy fresh fruit and vegetables is from the street vendors. Many specialise in just a few things. Often you hear the sing-song cries of the guy selling onions or the guy selling bread. It became quite reassuring hearing the sellers call out their wares to the inhabitants of the city, comforting like the call to prayer in Muslim countries (even though I’m not Muslim). 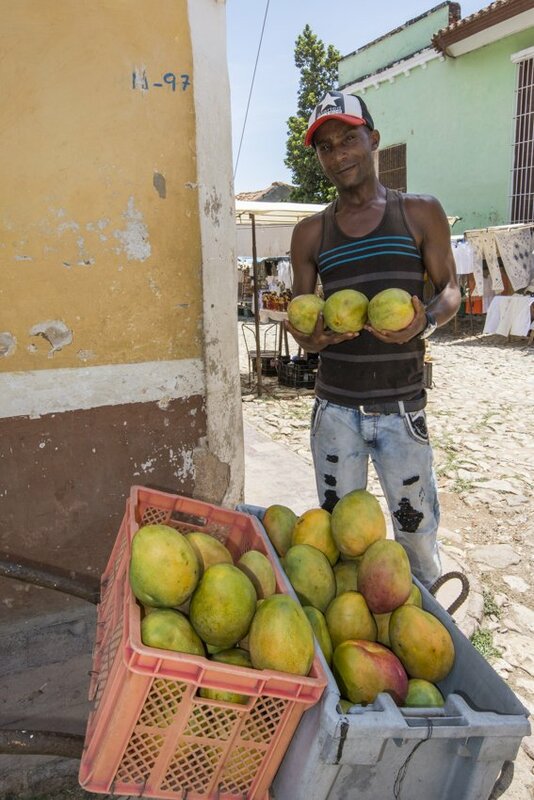 This guy in Trinidad only sold mangoes but boy were they good! So huge, sweet and juicy. In some cities the vegetable seller rode around the streets in a horse and cart, often stopping at houses that were obviously regular customers. 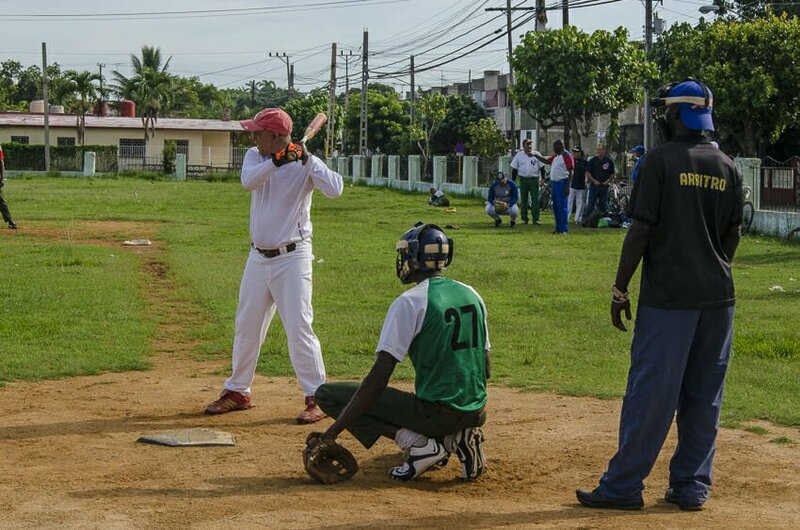 One Sunday in Cienfuegos we were on our way into town from our casa and stumbled upon a local baseball game of “mature” players (above forty). There are only three teams in their little competition but every Sunday they played at this particular park and took it very seriously. 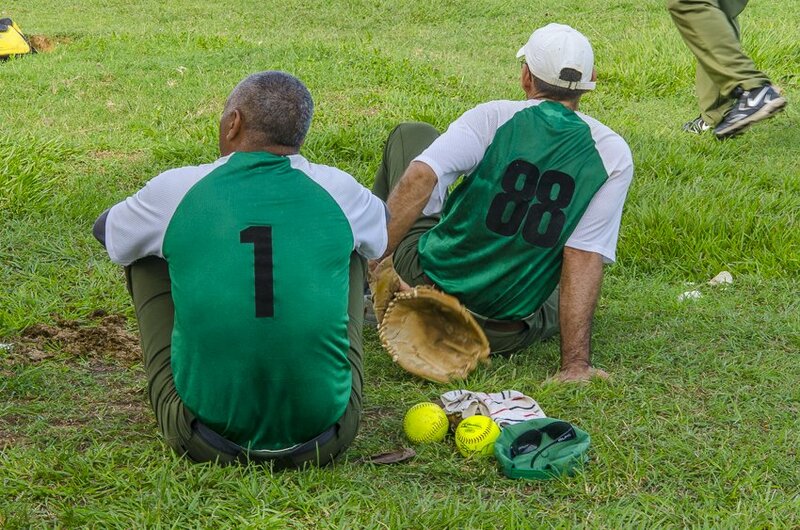 We got chatting to these guys while they were waiting their turn to bat. 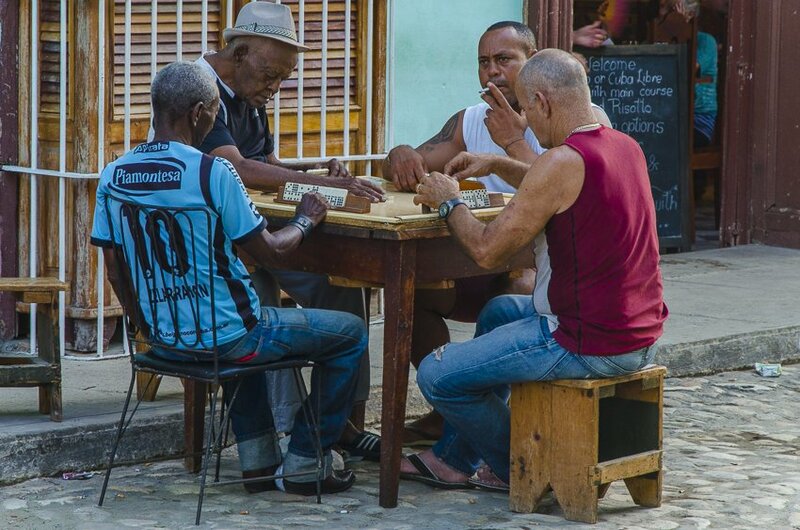 Apart from baseball, dominoes is a very popular past time in Cuba. 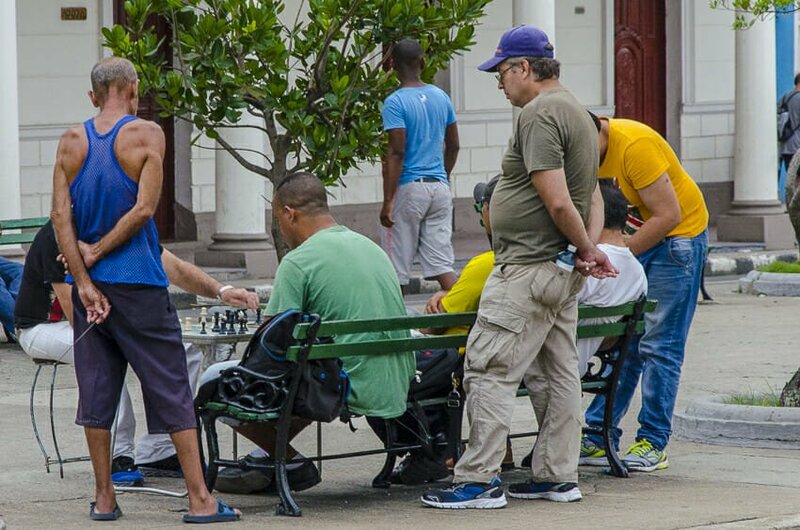 It is a common sight to see locals set up a table in the street and partake in a very serious game of dominoes. 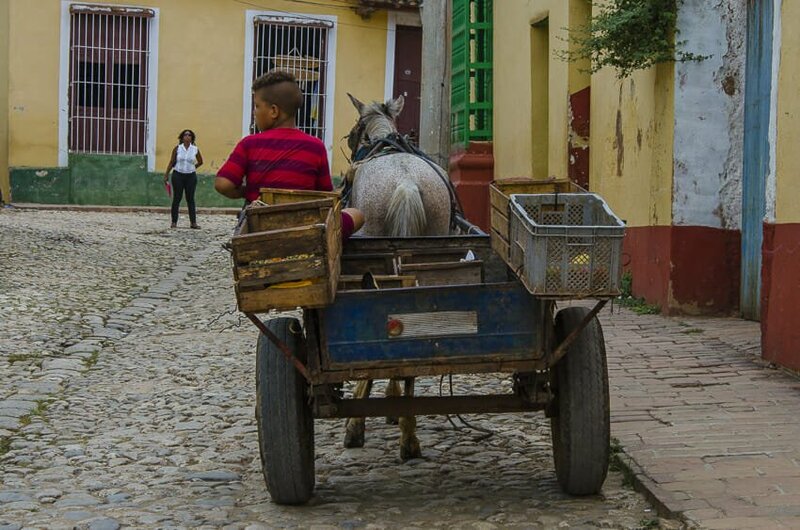 A great way to meet local Cubans and to get some recommendations, apart from staying in casas particulares (click here for more on casa accommodation), is to take a bici taxi and start a conversation. 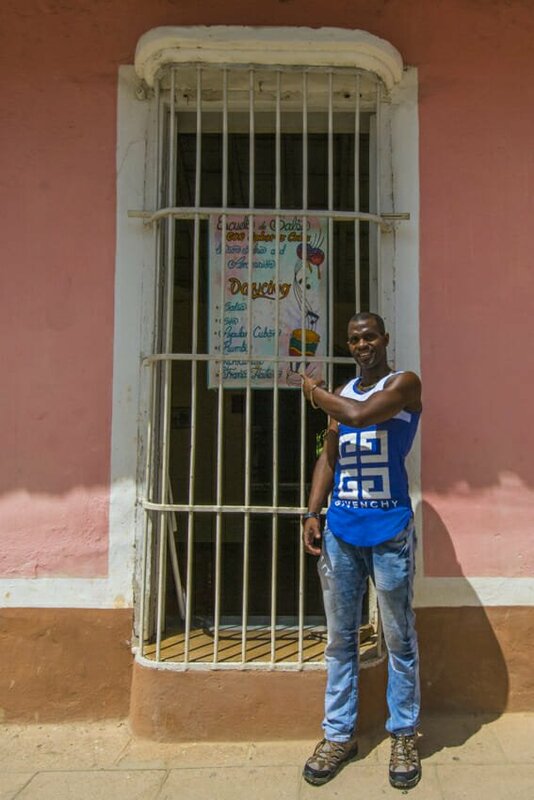 We even took a bici taxi tour in Santiago de Cuba with this guy, Daniel. 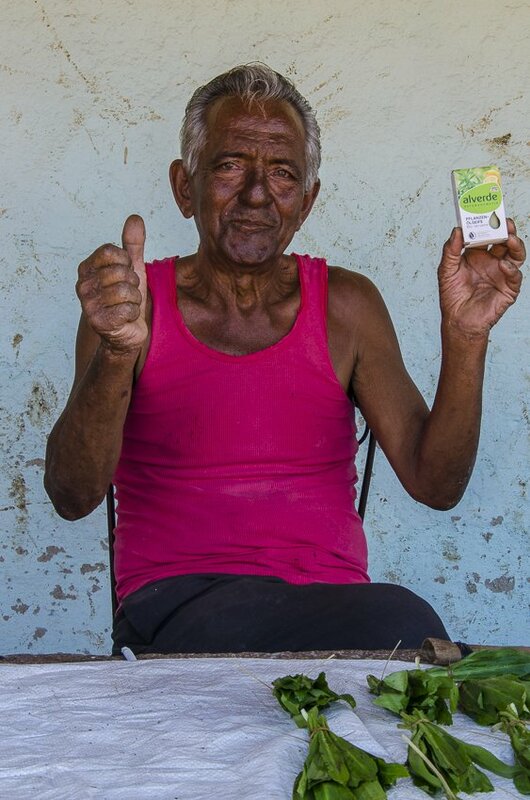 At the farmers market in Camagüey we got talking to this stall vendor, Fernando, who was very appreciative of the soap we gave him. He sold herbs at the market and had a heart wrenching story to tell. 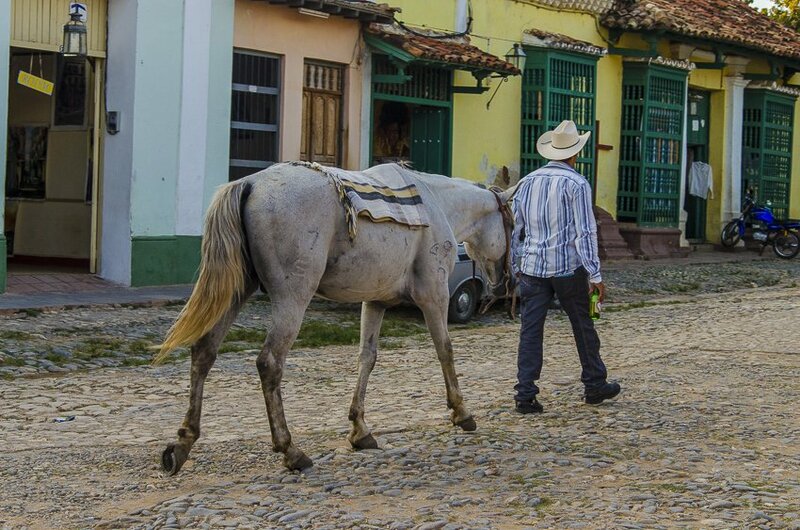 You see all sorts of sights wandering the streets of Trinidad, including a cowboy walking his horse home after a day at work in the fields. We also saw a guy walking his pig! 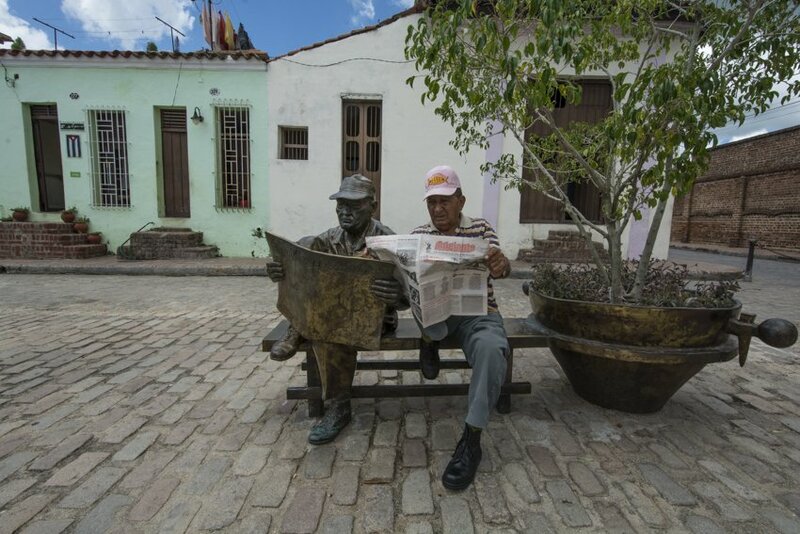 Any sort of tour is a good way to meet the locals, learn about the history and culture of a place. 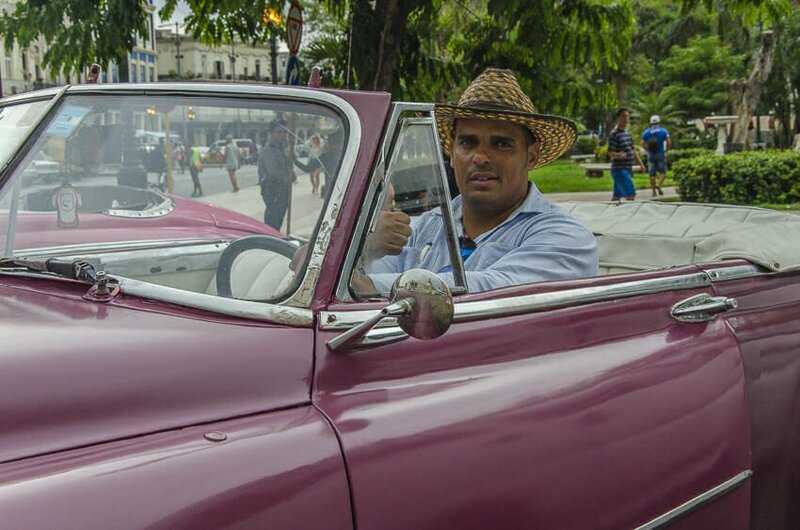 Fidel, our American car driver in Havana was very knowledgable and kept us entertained for the whole hour. 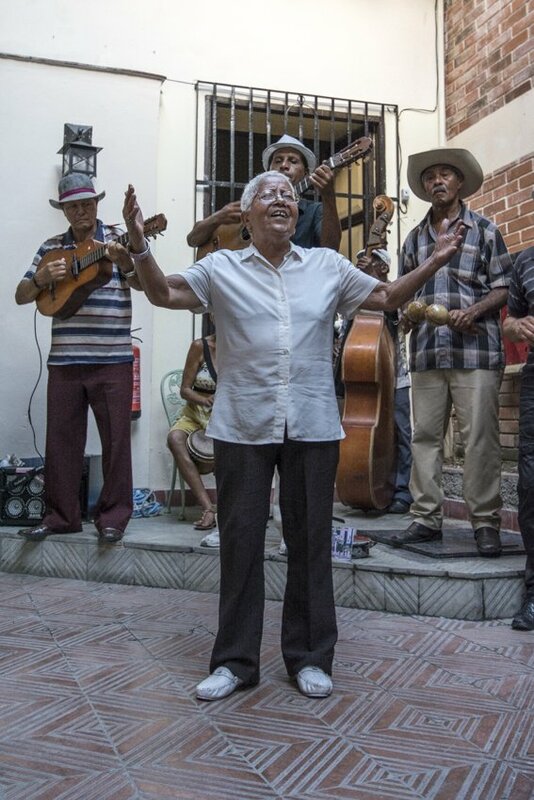 He loved his music and introduced us to some of his favourite Cuban songs along the way. 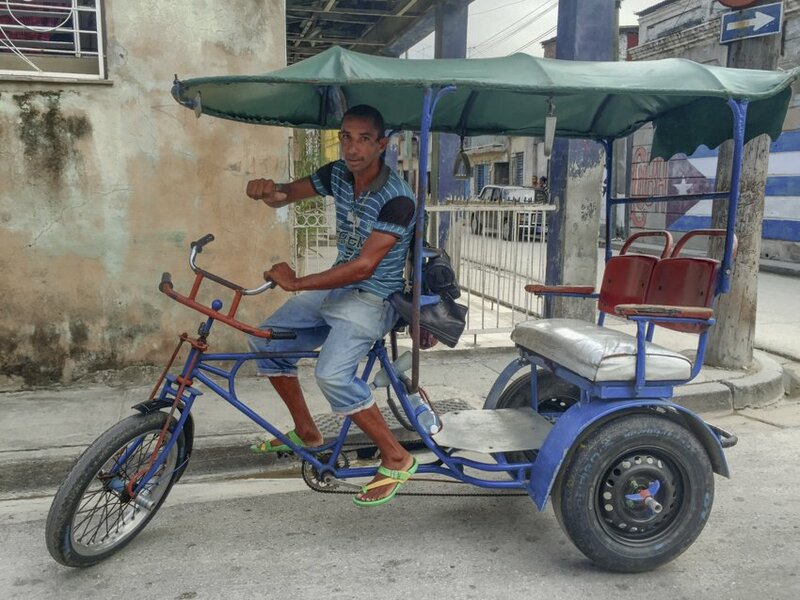 Cubans are very resourceful and make a living in any way they can. 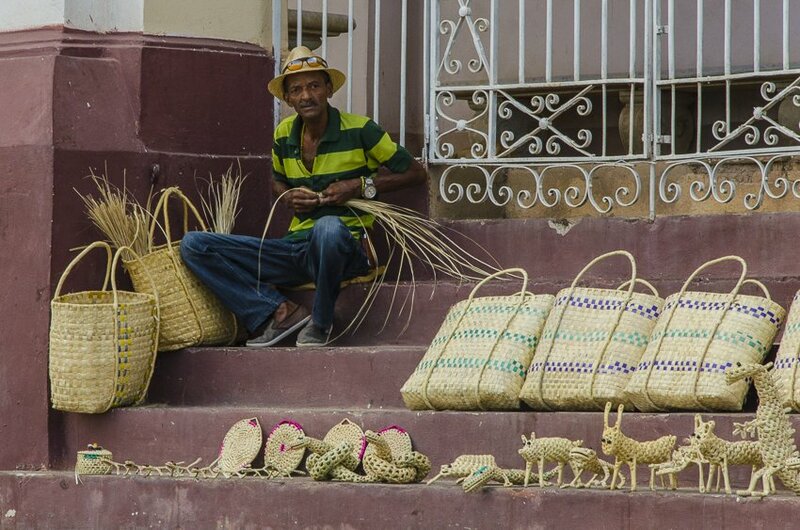 As you can see, this guy on the steps of the Cathedral in Trinidad cannot only cleverly weave baskets but is able to create all sorts of animals as well. 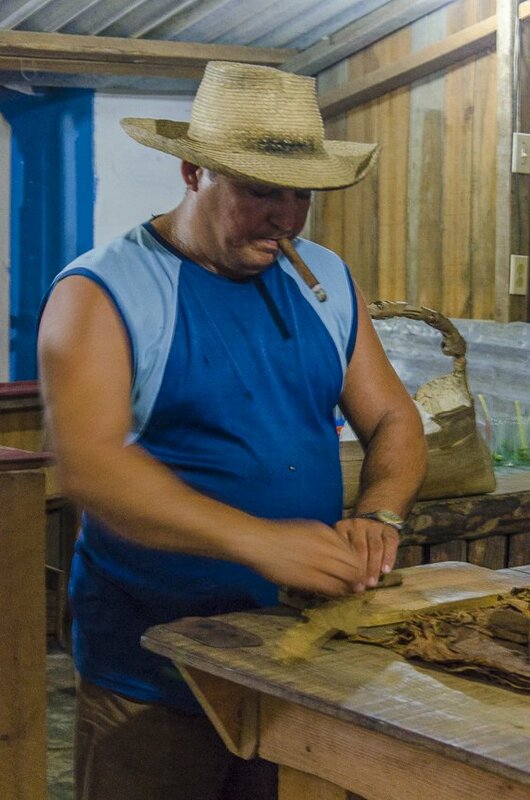 Tobacco is one of Cuba’s main industries and to be a tobacco farmer requires you to know about the tobacco making process from beginning to end. Cubans are very family oriented. Often an extended family lives in one household. This means grandparents often help raise the grandchildren while the parents go to work to earn enough money for the whole family. Our tour guide Luis was a wealth of information about the Santeria religion and very open about discussing the Cuban way of life. 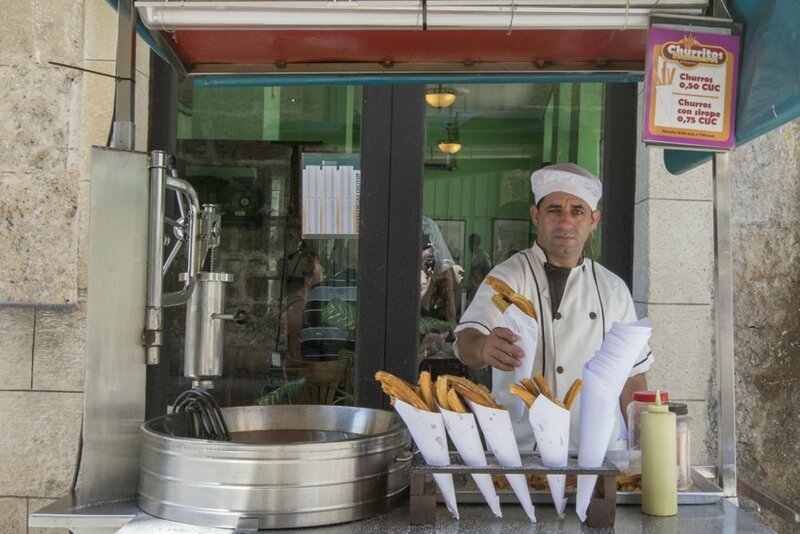 Churros are found all over Cuba and are great for that sweet craving. 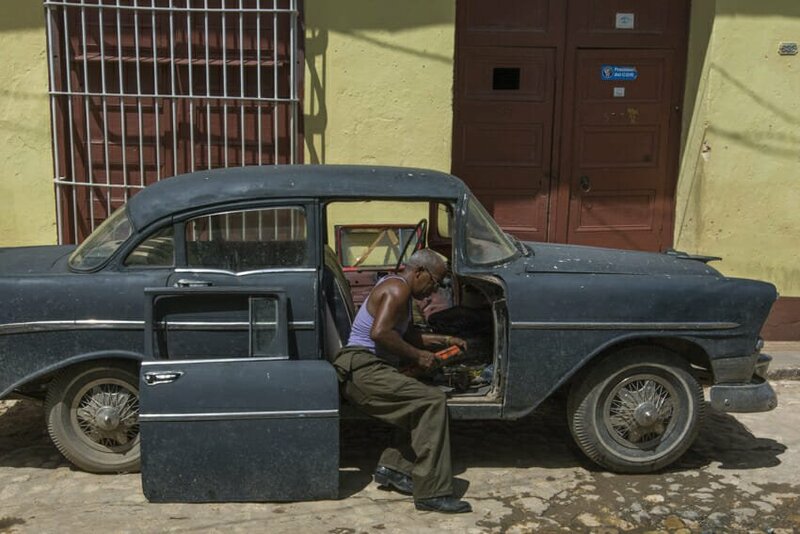 When visiting Cuba it is like stepping back in time, particularly where the cars are concerned. Many people have to keep patching up their old cars and combine parts of different cars to keep them running. When locals start talking to you be wary because a lot of the time they want something from you. However, also be open to the possibility that they just want a good old chit chat. 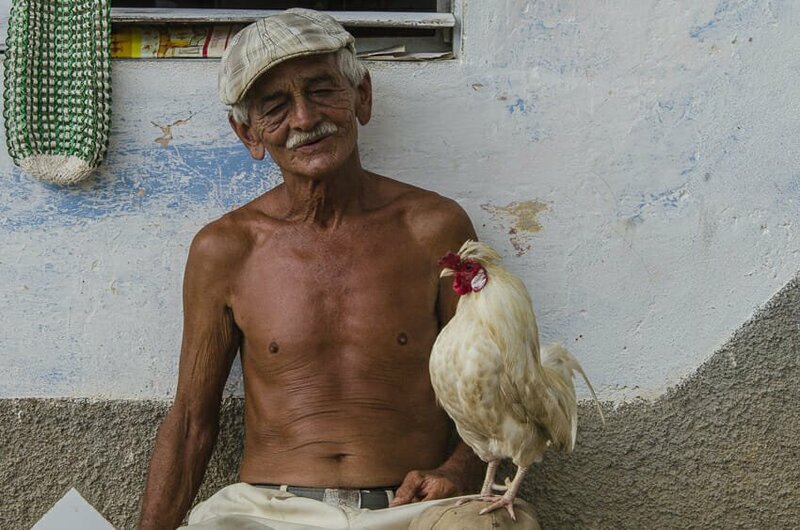 This guy with his chicken was pretty happy to have his photo taken. And this guy in Camagüey was hilarious. He claims that the statue he is sitting next to was based on himself. We found Cubans to be very open to everything from a bit of a chat to deep and meaningful conversations about life in Cuba. Either way, we loved meeting each and every one of the people we talked to, even the ones who wanted something from us. We learnt so much about their culture, Cuban life and the Cuban people as a whole. It certainly enhanced our stay in Cuba. Most of the locals we met were very happy to have their photo taken though there were a few who wanted money for the privilege which we don’t normally condone. Don’t forget to always ask when taking photos of people. Would you want tourists coming up to you and randomly taking your photo every day? Have you been to Cuba? We would love to hear your thoughts and impressions. Would you like to go to Cuba and want to know more? Leave a comment and we’ll get back to you. 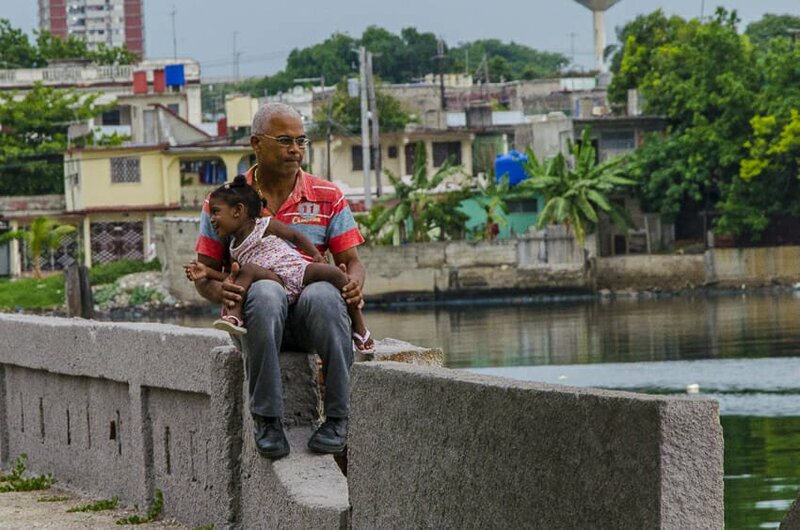 2 Comments on “Meet the People of Cuba, A Photo Essay”. Join the Conversation Here! Did people demand $$$ when you took their photos? Yes some people did. Only one of the guys from these photos asked for money. However we had already given some change to the buskers and bought food from the fruit and churros guys. The women dressed in traditional clothes are the worst for asking for money.